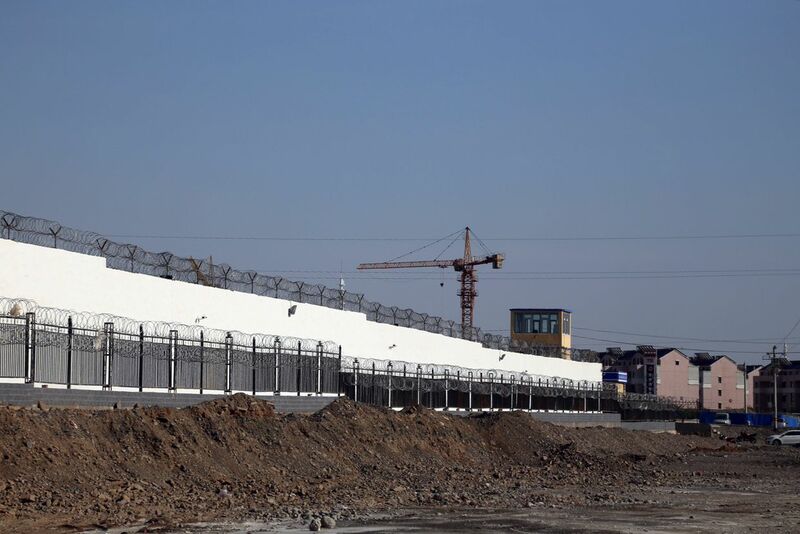 High walls and razor wire surround a facility in the city of Turpan in China’s Xinjiang region that Western researchers say is a political indoctrination centre for Muslim Uyghurs. Across the westernmost stretches of China where Islam has flourished for centuries, the signs of a government effort to engineer a society of model citizens loyal to the Communist Party stand in plain sight. In the sun-scorched lowlands of Turpan, a city in the Xinjiang region, cranes tend a construction site where high walls surround both completed buildings and concrete shells. This site, part of an expanding network of centres for forced political indoctrination and skills training, will soon hold additional people who authorities say need to be scrubbed of what they deem to be extremist thoughts. Western scholars estimate hundreds of thousands of people are already detained in such centres, many of whom are Uyghurs, a largely Muslim ethnic group. In the regional capital of Urumqi, past the scanners that register each person entering a residential compound, stickers affixed to apartment doors ask residents to report for an “in-home interview.” At a prominent mosque in the city, the prayer hall sits empty behind locked doors. A security guard says it’s under renovation. But it’s not clear any work is being carried out. Three weeks earlier, a young man working nearby caught a glimpse inside when he was asked to move furniture. It looked “the same as before,” he says, with one exception: “a big camera” pointed at anyone who might enter. Chinese authorities and academics say Xinjiang is besieged by religious radicals bent on national upheaval. After years of a militarized attempt to combat what authorities say is terrorism, China is declaring success in stamping out violence in the region. Now the state has shifted to an educational effort, a sweeping “de-extremization” campaign to instill patriotism and Chinese socialist values while excising what authorities say is cancerous thinking that has endangered social stability. In late October, The Globe and Mail travelled to Xinjiang to better understand what is taking place. For nearly 1,600 kilometres, The Globe was followed and tracked by people who would not provide their names, some of whom drove vehicles without licence plates and followed The Globe on foot. Some of the cars that followed The Globe in Xinjiang had no licence plates, driven by men who refused to give their name or say who they worked for. The heavy surveillance made independent reporting difficult since, according to many accounts from residents who have left Xinjiang, local authorities are suspicious of contact with foreigners. Uyghurs living outside China say relatives in Xinjiang have cut communication to avoid falling under suspicion. As a result, The Globe spoke with only a few Muslims in Xinjiang, a group that includes ethnic Uyghurs, Kazakhs, Kyrgyz and Hui, and is withholding their identities out of concern for their safety. Those who did answer questions described fear of practising their religion both in public and in private. State surveillance and the threat of detention in centres for political indoctrination and skills training keeps them away from mosques, even the ones that remain open. “I don’t go,” one restaurant owner said. “We can’t go,” said a woman in a village in eastern Xinjiang, before declining any further questions. The situation, her son said, has grown too “intense.” A few minutes later, six police entered the village on motorcycles, some of them bearing large black metal shields. Throughout the region, authorities equipped mosques with cameras to watch entrances and ID scanners with facial-recognition systems to document each person who walks inside. As far as the young man in Urumqi can tell, almost no one is taking that risk. A police officer stands behind a large metal shield in Turpan, in China's Xinjiang, where security forces have a very visible presence. The United Nations Human Rights Council is expected to scrutinize the Chinese government’s actions in Xinjiang on Tuesday as part of a periodic review of the country. In the lead-up, authorities and state media have emphasized that the government acted to quell a rising tide of extremism, safeguarding the well-being of all residents by ensuring their security. A Chinese delegation in August told the UN Committee on the Elimination of Racial Discrimination that China “pays special attention to respecting the religious beliefs of ethnic minorities and to protecting their cultural heritage” and “invests a great amount of capital in the maintenance of temples and religious sites.” Supportive government policies brought almost 1.85 million people in the region out of poverty between 2014 and 2017, state media reported in October. Chinese state television have aired interviews with detainees in what officials called a centre for ”vocational education and training.” Such centres are part of dozens, perhaps hundreds, of facilities built in the past 18 months where Western scholars say authorities detained as many as a million people and subjected them to forced political indoctrination. Former detainees have told The Globe they were ordered to recite lines expressing loyalty to Chinese President Xi Jinping and faith in the Communist Party rather than religion. That description stands in striking contrast to what current and former residents of the region told The Globe and Mail. Because of the difficulty of reporting inside Xinjiang, The Globe interviewed overseas Uyghurs and foreign researchers who have visited the region in recent months. Their accounts, like that of the young man near the mosque, describe a place where, both inside and outside centres for political indoctrination and skills training, authorities have so profoundly interfered with normal religious observance that some people believe the real target is Islam itself. Guard towers, high walls and razor wire surround a facility in Turpan, China, that locals say is used for "education" and western researchers say is a centre for political indoctrination and skills training. The authorities created complex human and digital monitoring systems that can detect even private religious observance. This includes a system of mutual reporting that makes people responsible for each other, and a “homestay” policy in which a million local Chinese people – most of them members of the dominant Han ethnicity – have been recruited to regularly sleep inside the homes of Muslim ethnic minorities. In one Urumqi apartment building visited by The Globe, several doors were sealed with a sticker from a “household cadre” telling the resident to call a number to receive an “in-home interview.” Such inspections have made Muslims wary of even praying at home. The Chinese government “wants to change the religion” in Xinjiang, said Erhan Arip, a Uyghur linguistic historian living outside China who visited Xinjiang three times this year. Authorities want to shift allegiances to “Marxism, or Chinese government ideas,” he said. Government pressure on the Uyghur community is long-standing, with scholars pointing to the Soviet Union’s dissolution – which had some of its former territory fracture into the independent countries bordering western China – as when Beijing began to worry that the people of Xinjiang, too, could one day push for secession. “This is what kicked off the really awful excesses that are happening now,” said Prof. Smith Finley, who started researching China’s Uyghurs 27 years ago. She spent three weeks in Xinjiang this summer, splitting her time between Urumqi, the capital, and Kashgar, which has long been the region’s most vibrant centre of Islamic life. “They have desanctified most of the mosques in Kashgar,” she said, in part by removing the crescents that once stood atop their minarets (crescents were briefly removed in Urumqi, but have since been reinstalled). Other mosques have been changed from their religious function. Official statistics still show more than 24,000 mosques in Xinjiang. But in Kashgar, “the only mosque I saw that was open was the one that was converted to a café,” Prof. Smith Finley said. “So religion is absolutely enemy number one,” Prof. Smith Finley said. Arabic calligraphy that adorned the front entrance to the mosque “has been ripped off,” she said, leaving broken masonry in its place. In years past, 10,000 worshipers might crowd Id Kah on Fridays. When Mr. Arip visited a few months ago, he saw only a few elderly people praying. Other mosques in the area have “already been destroyed,” he says. Although mosque attendance remains allowed in Xinjiang, those entering a place of worship are identified, registered and, Prof. Smith Finley said, can face severe consequences. State employees can lose jobs; retirees can lose pensions; owners of independent businesses can be sent away for political indoctrination and training. The doors of a mosque are padlocked in Turpan, in China's Xinjiang region, where Muslims say they fear the consequences of worshipping in public. The animosity toward the Muslim population extends beyond government officials. Charles, a Uyghur Canadian whose full name The Globe is not using for fear of reprisal against his family in Xinjiang, described an encounter he found disturbing from a recent trip back to the region. It is reminiscent, Prof. Smith Finley said, of the Cultural Revolution, the tumultuous period in the 1960s and 1970s that included a national campaign against the “four olds,” one of which was religion. In Xinjiang, authorities have strengthened bans on religious observance by Communist Party members, government workers and students. During Ramadan this year, teachers prevented exchange students at Xinjiang University from leaving their dormitory building in the morning until they had something to eat and drink, one former student told The Globe. Muslims interviewed by The Globe said their own homes have also effectively become illegal places for religious observance. Uyghur poet and filmmaker Tahir Hamut recalled the day last year he and his wife placed their religious books in a pot and set them on fire inside their kitchen. Because matches have largely been banned, they lit the books using the flame from their gas stove. Watching them burn left his wife afflicted. She felt “as if she had betrayed her own faith,” said Mr. Hamut, who left for the United States last August with his wife and daughters. The Dui Hua Foundation, a U.S. non-profit that focuses on the Chinese legal system, found court records that show authorities enforcing a ban on Islamic clothing inside private homes. Men in Xinjiang have also been dissuaded from wearing traditional ethnic square-sided ”dopa” hats, three people said. Local party officials, meanwhile, have published academic articles citing “secularization” as a goal for government policy. Even the most intimate areas of life have received state attention. In 2014, one area in Xinjiang offered a 10,000 yuan bounty – worth $1,890 today – to Uyghurs who married someone from the dominant Han Chinese ethnicity, Chinese media reported at the time. Those efforts continue: On Oct. 12, the state-run Hotan Daily published an article about three such weddings celebrated inside the gates of the No. 14 special police detachment, in the city of Kurumkash, whose name in Chinese is Kunyu. Called “I love Kunyu, I’m doing my part for security,” the festivities promoted “a more stable and harmonious society,” and also allowed female guests to interact “intimately with police, and as a result, the distance between them was greatly diminished,” the Hotan Daily reported. Meanwhile, the definition of “extremism” has expanded. When Charles was in Xinjiang earlier this year, he tried to visit a former colleague, only to be told the woman had been taken away for donating money to help poor Uyghur students with university tuition. High walls and razor wire surround a facility in Turpan, China, that locals say is used for "education" and western researchers say is a centre for political indoctrination and skills training. Cranes are being used to construct additional buildings at the site. The Chinese anti-extremism effort is augmented by large centres for political indoctrination and skills training, where authorities say they are working to foster a new sense of citizenship and responsibility. For detainees, the first step is to “break their lineage, break their roots, break their connections, and break their origins,” according to a government document uncovered by Agence France-Presse. Across Xinjiang, work is under way to expand those centres. In the city of Turpan, several cranes were active at one such centre when The Globe visited. Police deleted pictures of the construction activity taken by The Globe, but satellite imagery shows the location is roughly doubling in size. Because authorities can send people away for indoctrination and training without a formal trial, that system has also given officials leverage in shaping the conduct of people who have not been detained. Many Muslims in Xinjiang now reject even simple expressions such as “As-salaam-alaikum” – the Arabic-language greeting that means “peace be unto you” – out of fear it will be seen as a sign of religious extremism. “Nobody dares to say it, because once you are caught speaking it you will be arrested and sent to indoctrination right away,” a Uyghur businesswoman told The Globe. The young man near the mosque, too, knows the consequences of being seen as too fervent. Three months ago, his grandfather, 87, was taken away to a centre for political indoctrination and skills training. “His guilt is he can read the Koran,” a skill he had learned nearly 40 years ago, the young man said. Fifteen days after entering the centre, his grandfather was dead. The young man believes the conditions were too harsh and the food too poor. He worries authorities will one day take him away, too. So like his peers, he abstains from religious observance.